Let’s talk about wealth management with evidence-based investing, a way that can put the odds of success in your favor. When it comes to your investments we take a disciplined, well-researched approach known as Evidence-Based Investing. Our investment philosophy is based on Nobel Prize-winning academic research, and because we’re committed to your best good (rather than selling you products), our recommendations are carefully designed to meet your unique goals. Many investors have unfulfilled expectations. They’re looking for an honest solution — one that can lead to a better investment experience. A truly refreshing approach to wealth management. What would that approach look like? How can their financial advisor improve the odds of success? By first having a clear strategy for managing the market’s ever-unfolding uncertainties, you can stay focused on the right processes, the right tools, and the right mindset to guide you toward your most heartfelt goals. As we’ll describe in a moment, we believe in the simple elegance of what we call evidence-based investing. You may also hear of it referred to as “passive investing” it is, however, much more than that. Whatever you call it (and before we describe what “it” is), the first step in establishing a successful investment experience is to recognize the night-and-day difference it makes when you have a solid wealth management strategy to depend on during your life-long decision-making. At the end of the day, to make money in the markets, you must buy low and sell high. But what should you buy and sell? And when should you act? With no overarching strategy, your choices become a random search in an immense financial desert. You may still find your way if you are lucky. But you may run out of gas before you do. That’s a stressful way to go about managing your money. If your strategy isn’t built to last, then you may as well not have one, to begin with. The next step is to choose not just any strategy, but one you can apply with confidence through thick and thin. Investors are otherwise too often moved by volatile markets, veering off-course to chase skyrocketing trends or flee sickening drops, forever second-guessing themselves and “starting over” whenever current events test or tempt their resolve. How have the markets actually worked in the real world? Decades of peer-reviewed inquiry by scientists and practitioners around the globe helps us continuously hone our understanding. The strategy you adopt should be intuitively logical – not only to financial economists but to you, too. 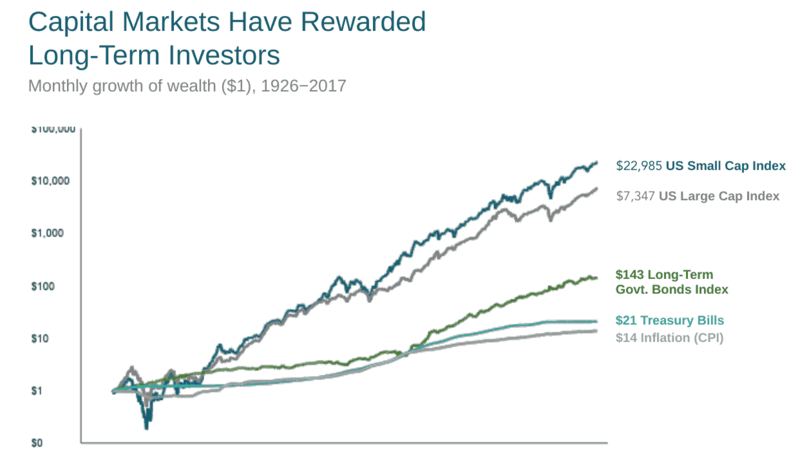 There’s a quiet power in understanding how to already be there to capture available market returns – rather than forever chasing after them, as most investors do. While ongoing inquiry and new insights continue to add to our understanding, a core of essential tenets has emerged to withstand the critical tests of time and multi-disciplined scrutiny. 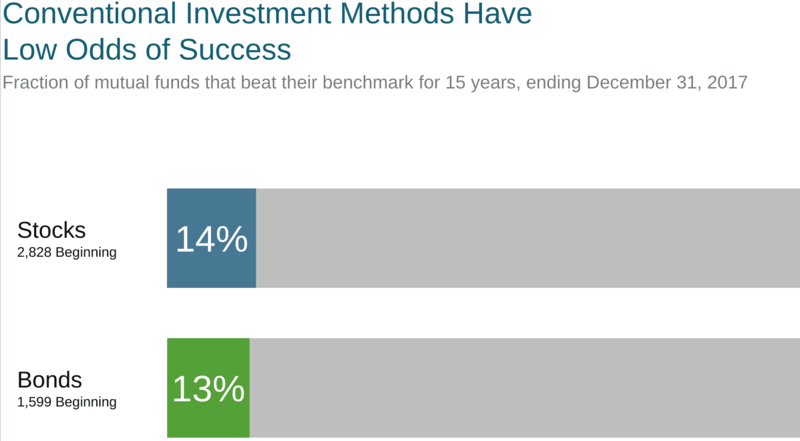 The best way to capture market returns is to participate in expected long-term growth. This insight comes from the evidence indicating that markets are functionally efficient as they drive our capital economy, delivering wealth to its body of participants over time. You can try to outperform others by speculating on individual securities or hot trends. But your odds are poor, to say the least. The added effort is not expected to deliver more than what the market already delivers to its body of participants. It’s far more likely to generate increased costs and complexities, eroding your ability to remain true to your own plans. Why go there? We want you to efficiently capture the market factors that are expected to contribute to your personal wealth over time. To do that, we’ll structure your investment portfolio plainly and sensibly – and explain it to you fully and openly– so you can stick with it throughout market risks and uncertainties. Because risk and reward are strongly related, they need to be deliberately managed to reflect your unique goals. While the market as a whole is expected to deliver wealth to its body of participants, clearly, there are individual winners and losers. The greater the expected return you seek, the more market risk you must accept … but only to the extent that it makes sense for your personal needs. Are you still aggressively building wealth? Beginning to spend it down in retirement? Preparing for a durable legacy? You want to strike a fitting balance between your needs to preserve the wealth you’ve achieved versus accumulating more over time. In accordance with your financial goals, we design your custom investment portfolio to expose you to an appropriate mix of market factors. We balance those factors expected to earn less but perform more reliably, with those that are expected to be a wilder, but higher-returning ride. 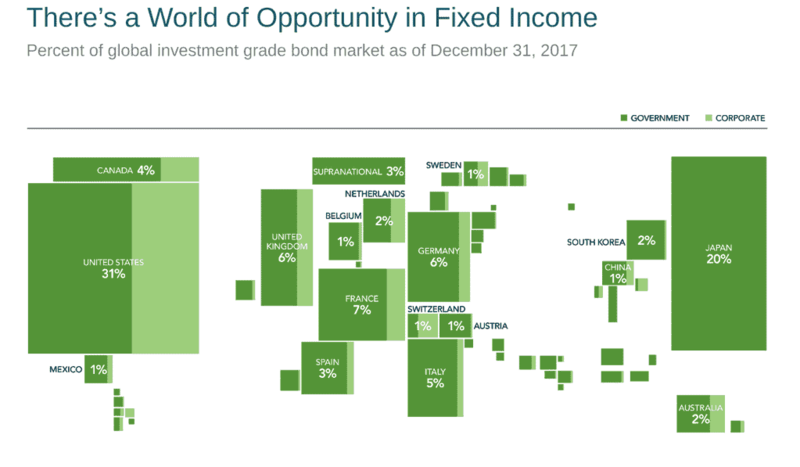 Your asset mix can include stocks versus bonds, as well as stocks that exhibit particular factors (such as those representing value versus growth companies, small-company versus large, and developed versus emerging economies). The right mix depends on your particular circumstances within the cycle of your life-long investment journey. Diversification helps dampen market risk. 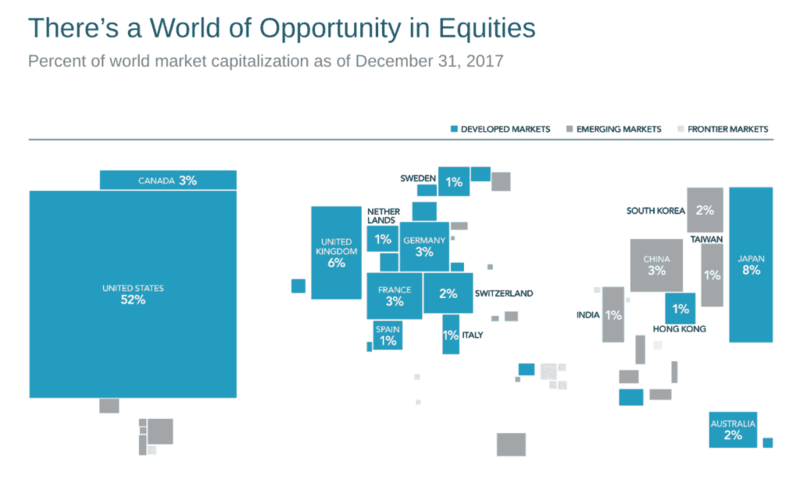 Diversification is another potent ingredient in managing market risk. Through broad and deep diversification (i.e., not just holding a number of securities but ensuring they are spread among a number of market factors), the sum of your whole risk can actually be lower than its individual parts. We allocate your assets among various market factors, as described above. Then, within each factor, we spread your assets among thousands of individual securities. To accomplish this, we turn to a handful of providers who manage their mutual funds according to the same strategy we espouse most notably, Dimensional Fund Advisors. Their practical, low-cost wealth management solutions allow us to apply sound financial theory to your investment activities. Giving you direct access to world equity and fixed income markets in a sensible manner. Cost management is among the most important ways we fulfill our fiduciary relationship with you – and one of the biggest ways we stand apart from most other financial services. An undercurrent throughout our investment strategy is the notion (based on copious academic findings) that eliminating unnecessary expenses is one of the best – and arguably most obvious – ways to make the most of your investment opportunities. After all, any dollar spent in a wasted effort is a dollar you don’t get to keep for yourself. The largest swath of the financial community earns its living on the commissions made when you place trades – whether or not those trades make any sense for you. Many others build their financial business by selling complex products such as hedge funds, variable annuities and privately traded securities that require extreme, buyer-beware scrutiny. These risk-laden products and their hidden costs may or may not reward you, but they almost certainly will reward those peddling them. Given the conflicting incentives found along the food chain of financial market players, it’s no wonder there’s so much misleading information filtering down to you, especially when it comes to costs you needn’t incur. As a Registered Investment Advisor firm, we are obligated to serve as your fiduciary financial advisor, strictly representing your highest financial interests. As such, we maintain a constant eye toward aggressively eliminating unnecessary costs on a number of fronts, as well as fully disclosing those that remain, so you can proceed with informed clarity. Now that you know those essentials, the next step is to turn them inward. Has the bulk of your portfolio traditionally been kept aloft with attempts to move in and out of the market, its sectors or particular stocks? Are you forever rushing to catch up with rapidly moving returns or bypass troublesome turbulence? Advancing instead according to the science of investing is the equivalent of turning your craft around and gliding with rather than against the powerful winds of trade toward your desired destination. We look forward to further exploring how Finley Wealth Management can serve as your investment manager along the way.